Their one-night stand turns into a tentative friendship, a relationship they both agree is temporary… until Victor’s denied asylum. Isaiah can’t offer Victor a happily ever after, but he can propose something that’ll keep Victor in the US and safe... marriage. He just doesn’t expect his new husband to dance away with his heart. Robin Covington is a new-to-me author, and I was surprised how much emotion could be packed in so few pages. His Convenient Husband ran the full gamut of emotions for me, strumming my heartstrings from the beginning to the end. Isaiah is a gay, widowed father, and an NFL player, who has to deal with the stressors of being in the limelight. He’s introverted, reserved, and doesn’t wish to be noticed – he’d rather stay in the shadows of fame, live his life and raise his son, and play football the game, not the media circus… but all of that changes when he meets his son’s idol. Victor is a ballet dancer, with all the trappings that comes with it. He’s Isaiah’s total opposite, wishing to be the center of attention. Victor has a voice which cannot be denied, advocating for LGBTQ rights, especially in his home country. Their attraction was incendiary from the start, but after an initial hook-up, the novel shifts into slow-burn territory. ANGST, and more angst – Victor seeks asylum on US soil but is denied, so starts the marriage of convenience trope, but it has much more depth and strife than others of its ilk. Isaiah refuses to bring emotion into their relationship, forever mourning his late husband, terrified of loving and yet again losing them. Victor feels resentment as he competes with a ghost. While the couple is the perfect balance, Isaiah has a propensity to behave like a douche to push Victor away, and understanding and compassion only goes so far when you wish to keep your self-respect intact. I highly recommend this title, especially to those who are fans of the author and MM romance. His Convenient Husband was a well-written novella, giving a full spectrum of emotions from developed characters, and a complete story from start to finish. This is a well-developed, emotionally-packed novella. You are given a scenario that seems impossible, only to see how love can truly overcome the obstacles of life. Isaiah and Evan have suffered an immense loss. They are still grieving to a point, but Isaiah, a NFL star, is trying to move on with his son, Evan, and Evan is just trying to figure out his place in the world. When Evan goes with his dad to see Victor dance, all the rules go right out the window. There is an immediate attraction between Victor and Isaiah. However, due to an over-developed sense of devotion on Isaiah's part, their relationship becomes one of convenience. Isaiah is shy and hates being in the limelight. He is also fiercely protective of his son. Victor is an activist and doesn't mind talking to the press about the horrible lifestyle that gay people in Russia have to endure. When emotions run high, it limits their ability to communicate and see that love will help heal. This novella was full of angst and emotion, but not in a cheesy way. I really enjoyed this. This book really wasn't my cup of tea. The blurb sounded really good, I thought going into the book I would at least like it if not really enjoy it. Sadly, I didn't like it. I found myself skimming at times, I was hoping it would get better but it didn't. I couldn't stay engaged with the storyline or the characters. I usually connect with someone, anyone in a book, but this time I didn't. I can't even pinpoint why, I just know it didn't work for me. I am sure others will love it, I seem to be the minority when it comes to not liking this book. Victor and Isaiah’s ‘marriage of convenience’ is actually plausible and Victor’s experience as a gay man in Russia makes the story timely and relevant. I loved Victor and I really loved Isaiah’s son Evan. They are both passionate and vibrant and their artistic talents give them an instant connection. I loved Victor’s passion for dance and his fierce championing of gay rights. He is a wonderful leading man. Evan is an inspiring and original teenager and I’d love to read his YA or NA story. However, I struggled to engage with Isaiah. He’s bland. For a man who was married to another man for some time, he is oddly closeted. And fearful. I would also expect most het parents to give their queer kids more support than Isaiah does as a gay man. By the end of the story, Isaiah was so hurtful towards Victor that while I wanted Victor to be Evan’s dad, I didn’t really want Isaiah for his partner. Ultimately, I feel like the premise/blurb has more promise than the actual story provides. This is a low heat story – but it is also low romance. I know it’s a marriage of convenience, but I never felt like the relationship became anything more than friendly and convenient. I really enjoyed this book – I love sports romances, but that the other protagonist is a ballet dancer, just added to the hotness. The descriptions of what Victor was wearing (usually not a lot) were super enticing – no wonder Isaiah found him hard to resist! This is a story with considerable depth and so much more than I really expected. Isaiah is a good man, and in spite of great personal sadness, he immediately steps in with a solution – and the knowledge that resisting temptation will be difficult. His love for his son, and the pleasure in knowing how Victor treats him is beautifully written. There was a lot of fun and humour too; their manager, Ian, was a funny guy and the perfect foil for the two of them. All in all, this book is a definite hit for me – I have been thinking about it all day! A USA Today bestseller, Robin Covington loves to explore the theme of fooling around and falling in love in her books. Her stories burn up the sheets... one page at a time. When she's not writing she's collecting tasty man candy, indulging in a little comic book geek love, and stalking Chris Evans. Don't send chocolate... send eye candy! Robin's books have won the Golden Leaf Award and finaled in the Romantic Times Reviewer's Choice, the Book Seller's Best and the National Reader's Choice Awards. She lives in Maryland with her handsome husband, her two brilliant children (they get it from her, of course! ), and her beloved furbabies. 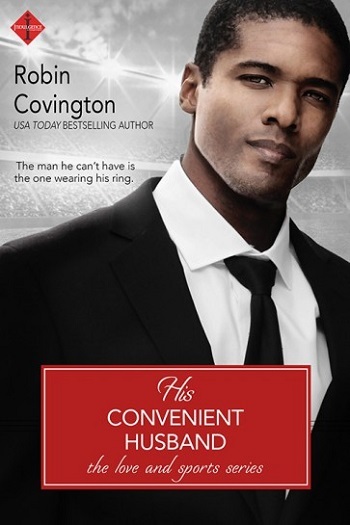 Reviewers on the Wicked Reads Review Team were provided a free copy of His Convenient Husband (Love and Sports #1) by Robin Covington to read and review.